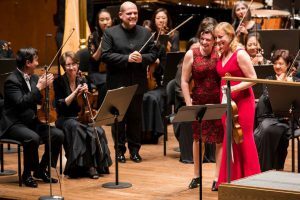 Commissioned by the League of American Orchestras and the New York Philharmonic, Alan Gilbert, Music Director, with generous support from the Virginia B. Toulmin Foundation. In Unearth, Release, the viola’s voice emerges from dark, dense textures and rises towards light, misty atmospheres. The relationship between the viola and the orchestra transforms over the course of the work’s three movements. The entangled, combative “Captive Voices” of the first movement threaten to consume the viola while she strives to assert her musical identity and expressive power. In the second movement, “Surface Tension,” the viola and orchestra engage in a competitive dialogue that is at once playful yet taunting. In the work’s final movement, “Embracing Mist,” the viola hovers above the orchestra, gliding freely while echoes of her music pervade the orchestra’s thinning atmosphere. The work reveals a transformation from sinking to swimming to floating, from drowning in uncertainty towards embracing ambiguity.